Manning is an unincorporated community in Washington County, Oregon, United States on the Sunset Highway (U.S. Route 26/Oregon Route 47). The Banks–Vernonia State Trail, a rail trail conversion, passes through Manning and has a trail head. The NorthWest POINT offers twice-daily roundtrip intercity bus service between Portland and Astoria with a flag stop in Manning. Manning was named for Martin Manning, who took up a land claim there in 1865. Manning post office was established in 1890. In 1954, the community joined with neighboring Buxton and Banks to form the Tri-City Rural Fire Protection District (now Banks Fire District). The Manning school, part of the Banks School District, closed in 1987. 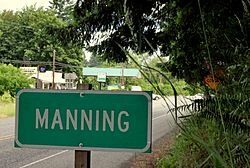 Manning, Oregon Facts for Kids. Kiddle Encyclopedia.